Volunteers start on a new home at 7308 Park Meadow in Oklahoma City’s Legacy Estates addition as part of Central Oklahoma Habitat for Humanity’s annual Women Build. Update May 5, 2017 at 1:44 p.m.
On Friday, the Senate Joint Committee on Appropriations and Budget passed an amended version of the bill, now called HB 2403. It now excludes charitable giving from the $17,000 cap on itemized tax deductions. Non-profit organizations successfully opposed a measure in the state senate that would have raised state revenue by limiting itemized tax deductions. House Bill 2347 would have capped itemized deduction at $17,000, and could have raised nearly $166 million. But several non-profit organization argued the measure would take away an incentive for people to give to charity. The Journal Record’s Catherine Sweeney reported on Tuesday that wealthier families tend to itemize their tax deductions because it could save them more money than standardized deductions. Real estate taxes and mortgage interest are eligible for a write-off, but so are medical expenses and charitable giving. 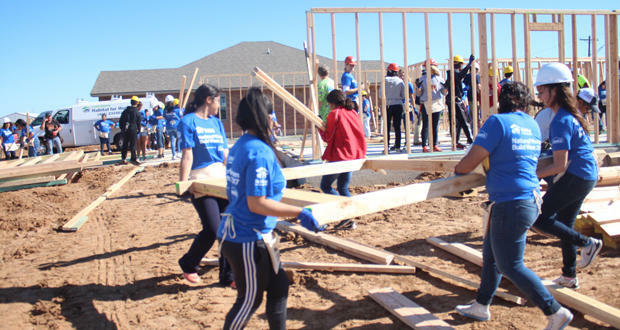 Central Oklahoma Habitat for Humanity is one of several organizations that came out against the measure within 24 hours of its introduction. Its objections were based on both logistics and principles, said the organization’s CEO, Ann Felton Gilliland. The nonprofit works to help low-income families make repairs to their homes and prepare them for bad weather. After listening to concerns, House leadership chose to pull the bill, according to The Oklahoman’s Dale Denwalt. Journal Record editor Ted Streuli told KGOU that Oklahoma non-profits could have collectively lost out on $30 million had the bill passed. It also would have affected medical patients. Jacob McCleland: Ted, this bill that would have capped itemized deductions at $17,000, could have raised nearly $166 million, and wealthier families tend to itemize their deductions more. But House leaders pulled the bill after non-profits argued against it, saying the measure would balance the budget on the backs of the working poor. How so? Ted Streuli: Well, the argument was that it would take away a lot of the incentive for people with means to give to those charities. And so those non-profit organizations really do a lot to help the poor, including the working poor. And people were afraid that capping the deduction would really limit charitable giving. McCleland: So what was at stake here? Among the non-profits that Journal Record reporter Catherine Sweeney talked to, how much funding could they have lost? Streuli: The Oklahoma Center for Nonprofits told us that when they looked at that they estimated that non-profit organizations could lose as much as $30 million collectively. McCleland: Opponents of the measure have said that Oklahomans rely more on the services of charities during tough budget times, such as now. Do we have any figures that indicate that? Streuli: We didn’t get specific numbers from anyone, but there is broad consensus that non-profits here always step in to fill the gap when the state government doesn’t have enough money to provide all those services. McCleland: How would the measure have effected patients with high medical bills? Streuli: Out-of-pocket medical expenses are deductible if they meet the threshold, but those would count toward that $17,000 cap under this proposal as they had written it. Anybody who’s had a hospital stay would recognize how quickly medical bills alone could have exceeded the proposed cap. McCleland: I want to talk about another article from your paper this week that deals with the state budget crunch. This one is about construction of a boulevard in Oklahoma City that may hit a speed bump. This is the new boulevard that will connect the Oklahoma River, a new development, and the MAPS 3 park and convention center. So could the state’s budget woes delay this construction? Streuli: Well, the Department of Transportation certainly thinks so. They’ve already put some of their projects on hold, they’ve delayed some others that are already underway, and they’re now planning how to safely suspend work on more than 80 road and bridge projects under construction in case the state funding trend continues. If that comes to fruition, certainly that could affect the boulevard project. McCleland: How long has this boulevard been under construction? Streuli: Construction just started a year or so ago, but the project really began back in 1995 with plans to move the I-40 Crosstown freeway. The boulevard is going to go where the freeway once stood, and the first piece of it has already been done. McCleland: What’s left before this construction is complete? Streuli: There are two more phases, one, at a cost of about $7 million, is scheduled for contract letting in August. And then the final piece, which is a $15 million segment, is tentatively set for some time during fiscal 2018. McCleland: Could construction delays potentially cost the state more money down the line? Streuli: Well, potentially yes, and that’s because ODOT is on this 8-year fiscal plan to get roadways back in shape. And if they have to abandon parts of that plan, there’s no way to know what the eventual financial repercussions would be. But it’s a certainly safe to assume that nothing will get cheaper in the interim.